December 23, 2015 - ICARUS Devices will soon introduce a pilot training device that will fundamentally change the way pilot train for instrument flight. ICARUS, which stands for Instrument Conditions Awareness Recognition and Understanding System, will replace clumsy ineffective hoods and foggles that all pilots use during training. The goal of ICARUS is to reduce accidents caused by flight into bad weather, which are especially a problem for helicopters. "ICARUS is going to revolutionize how we approach pilot training. It provides experience to student pilots that we cannot provide right now outside of a simulator. This product will create a better and safer generation of pilots - it is a game-changer," said Audra Hoy, Director of AeroInnovate. 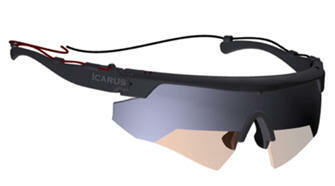 ICARUS glasses electronically switch between transparent and opaque allowing the student to experience what it is like to fly into and out of clouds. ICARUS will give students high fidelity, cost effective training for a variety of weather scenarios in the aircraft. Flight instructors will be able to control the students view outside the cockpit in flight with ICARUS; thus giving them the ability to simulate the visual sensation of breaking out on an approach, entering clouds or fog, going missed approach and Inadvertent Instrument meteorological conditions. ICARUS will allow the student instantly regain a fully clear visual in the event of an in-flight emergency, instead of the pilot fumbling around with a crude hood. ICARUS placed second at Defense Entrepreneurs Forum’s 2015 Innovation Competition and was part of the University of Wisconsin Oshkosh’s Aeroinnovate 2015 Accelerator class. The company will also compete in the Transportation Review Board’s 6 Minute Pitch competition in January. The company is partnered with Newovo plastics and Aeromotive Harnesses of Elgin, IL to produce the first ICARUS models and has launched a Kickstarter for pre-seed funding. ICARUS Devices, based in Austin, Texas, was founded by Nick Sinopoli, a pilot with an Aeronautical Engineering Degree from Purdue who has worked full time on the project since leaving the Navy in April 2015.